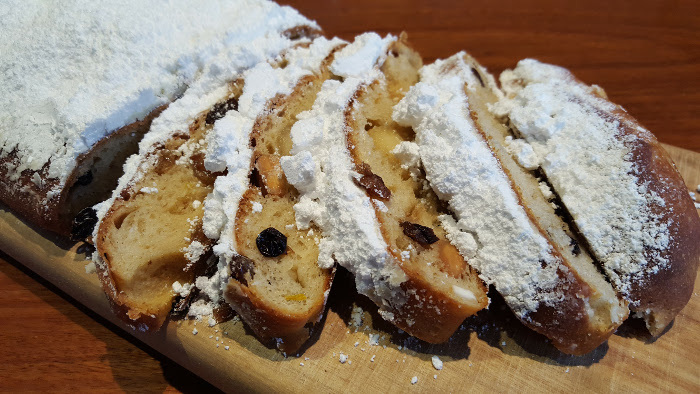 Learn how to make Stollen, a traditional German Christmas Bread. This is our first recipe that is not sourdough as it is a sweet bread and is normally made using yeast. This recipe makes 6 Stollen and they can be kept for a week or frozen and then brought out on Christmas Day. Add dried yeast to the milk and stir to mix and leave for a few minutes. Add the milk to the flour and mix until the flour is fully hydrated. Cover with cling wrap and leave to rest for 18 hours. Place blanched almonds on baking tray which has been covered with baking paper and roast in oven at 210°C (410°F) for 5-10 mins until golden. Add ingredients to a bowl and you can be generous with the wine. Leave to soak for at least 30 mins and place in a colander to removed excess juice before you add it to the dough. Cut butter into cubes and leave to soften. Baking Temperature and Time Preheat oven to for 40 mins to ensure stone is hot. Bake at 190°C (374°F) for 20-25 mins turning around and letting paper slide onto stone after 10 mins. Put the fruit in a colander to let the excess liquid drain out. Weigh and add flour to bowl. Weigh and add diastatic malt to the bowl. Add sponge to the bowl. Weigh and add salt to the bowl. Weigh and add sugar the bowl. Add eggs to the bowl, for 75g we used 2 eggs. 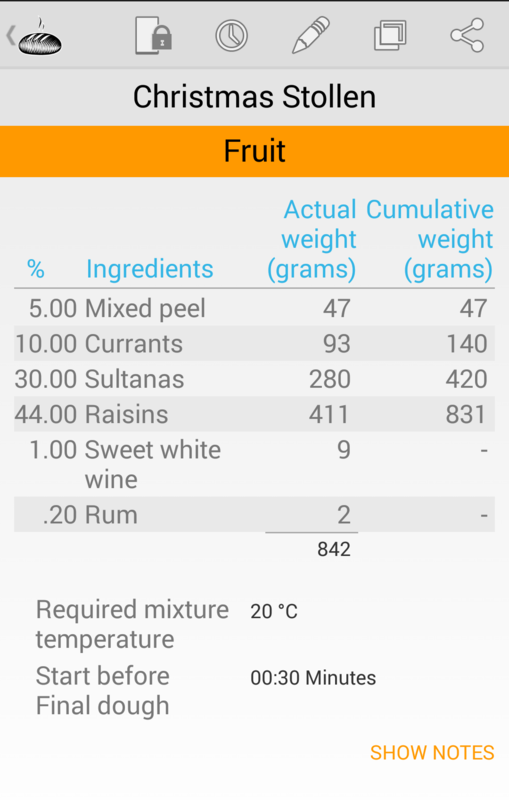 Weigh and add orange blossom water. Add dried yeast to the milk and leave to hydrate for a few minutes before adding to the bowl. Add mixed spice to the bowl. Add lemon and orange zest to the bowl. Mix all of the ingredients until the flour is fully hydrated and then rest in the bowl for a few minutes. Move dough to the bench and knead dough for 5-10 minutes. Add the soft butter to the dough and knead dough for a 5-10 minutes and then leave to rest for a few minutes. Spread the dough out and add the fruit and roasted blanched almonds and mix into dough. When the fruit and nuts are incorporated into the dough, place it back in the bowl, cover with a tea towel and leave to rest for the bulk fermentation time of 1 hour. Heat oven on max for 40 mins or until your stone is ready. Scale the dough into 6 500g(17.637oz) loaves and leave covered with a tea towel for the intermediate proof of 30 mins. On a dusted bench shape each loaf into a rectangle shape and roll the top third of the rectangle to form the first mountain, place the marzipan which has been rolled into a log, on to the bottom third, roll the dough over the marzipan to cover and place this roll over the middle of the rectangle to form the top mountain. Watch how this is done on the video. Place baking paper on a tray and place two stollens on the tray and bake for 20-25 mins at 190°C (374°F). Half way through the baking turn stollens around and place stollens and paper onto the stone. Put butter on very low heat 10 mins before the bread comes out of the oven. As soon as the loaves are removed from the oven place them on a wire tray. Using a pastry brush paint the loaves with the melted butter and then sift the icing sugar over the loaves. If you have our app then the alarms are worked out for you, here is an example of the schedule. Saturday 12.15 pm Bake 2 loaves at 195°C (374°F), turn and slide loaves on to stone after 10 mins. Saturday 12. 40 pm Bake 2 loaves at 195°C (374°F), turn and slide loaves on to stone after 10 mins. Saturday 1:05 pm Bake 2 loaves at 195°C (374°F), turn and slide loaves on to stone after 10 mins. If the dough does not double during bulk what should I do? Sorry, I haven’t responded earlier. 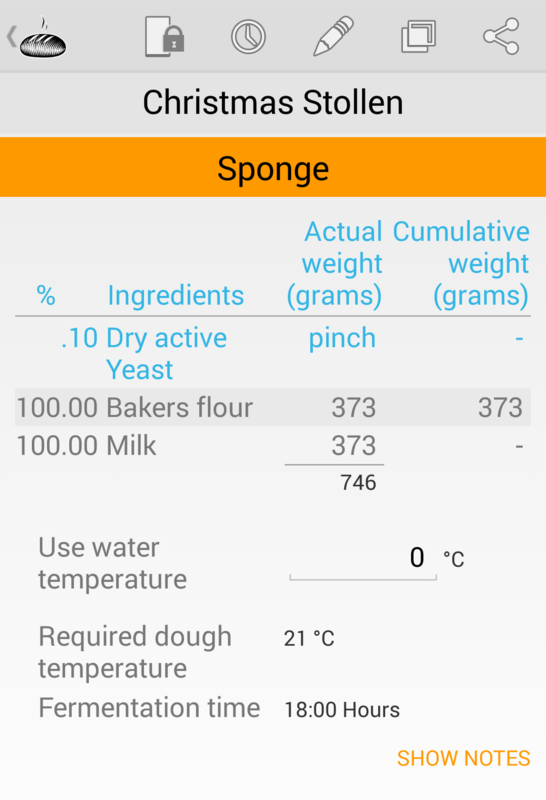 If you’ve weighed all the ingredients carefully and combined them correctly – meaning the “sponge” was mature you’ve either made the final dough it excessively cold because I can’t see how the yeast could not be active. However, all things being equal, if the slow activity is due to cold temp you can allow it to ferment longer with no harm. Failing that I need more info to divine where the problem could be. Q1.did the sponge triple over the 18hrs then begin to collapse? This indicates full maturity. Q2. When you added the balance of the final dough ingredients, did you develop the gluten before adding the fruit and nuts? Q3. What was the finished dough temperature and the ambient air temperature? Get back to me so I can help you.